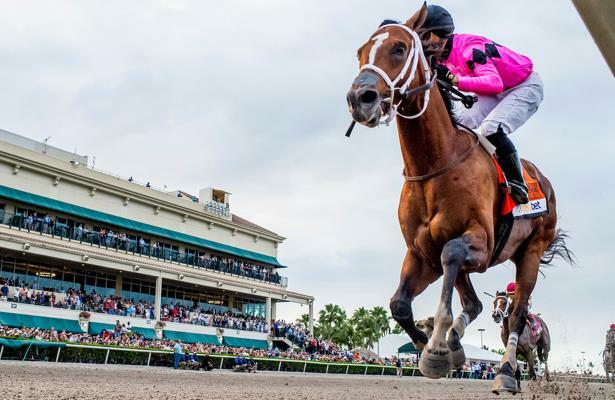 Just how good is the Florida Derby (G1) winner Maximum Security? The odds makers at William Hill US aren't taking any risks, installing the Jason Servis trainee as the co-favorite for the 2019 Kentucky Derby exiting Saturday's race. Maximum Security dropped from 60-1 to 4-1, matching the lowest price on the board with Game Winner, the champion 2-year-old who headlines Saturday's Santa Anita Derby (G1). Others with short odds include Improbable (6-1), Instagrand (7-1) and Code of Honor (8-1). • A trio of horses locked into the Derby on points are each listed at 40-1: By My Standards, Cutting Humor and Plus Que Parfait. Only the first of those, the Louisiana Derby (G2) winner, figures to go off at something lower on the first Saturday in May. • The Blue Grass Stakes (G2) appears an open affair, and trainer Todd Pletcher has been hot lately. His entry at Keeneland will be So Alive (75-1), the half-brother of Vino Rosso looking to improve after finishing third last time in Tampa Bay Downs' Sam F. Davis (G3). • A contender in Saturday's Wood Memorial (G2), Final Jeopardy (80-1) has the same connections as Maximum Security and will likewise be making his graded stakes debut in his fourth start. He enters off an allowance win at Gulfstream Park. • Decent future prices on the Santa Anita Derby will be tough to to come by given the number of known names in the field. Sparky Ville (120-1) may have no business running around two turns, but perhaps that's the right price to find out on the San Vicente Stakes (G2) winner.